John Glenn, left, lifted off on February 20, 1962 -- the first American to orbit the Earth. 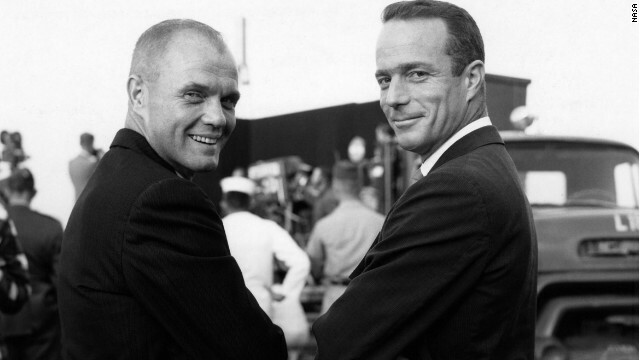 Scott Carpenter, right, followed in May. “It seems like it was two weeks ago,” former Sen. John Glenn told me. Glenn and I stood a few feet from a buffet table in a reception room at Florida's Kennedy Space Center. It was about 30 minutes before the start of a NASA celebration marking his and Scott Carpenter’s historic first U.S. orbital flights. For me, this was an amazing moment. There we were on Saturday night, just the two of us. John Glenn, who 50 years ago today became the first American to sit alone atop a 125-ton rocket and shoot around the world three times at more than 17,000 miles an hour. Glenn's mission made him a national hero who eventually left NASA and later served four terms as a U.S. senator from Ohio. But he couldn't stay away. Fourteen years ago, at age 77, he returned to orbit - on a much heralded shuttle mission aboard Discovery that put him in the history books again as the oldest person to travel to space. Now, at 90, Glenn is still lean and fit. Would he go again? “I’d go tomorrow if I could,” he said. Of course, the shuttle program is over, which Glenn told me he’s not happy about. I asked Glenn what was going through his head while he sat in that Mercury capsule waiting to lift off. It seemed like the whole world was talking about the race with Moscow to dominate space and rising Cold War tensions. No, he said. He didn't feel any pressure from the space race or the Cold War. The Soviet Union had already orbited a man around the world, Glenn told me. He was absorbed in the task at hand. “You just wanted to do the best job you could do,” he said. There was no time then to think about the bigger picture. Gaining orbital speed was a big deal. Scott Carpenter knew it. Carpenter - who was Glenn’s back-up for the flight - sat in Mission Control on that day 50 years ago. Three months later, Carpenter would become the second American to orbit the Earth. I asked Carpenter, who was now sitting just a few feet away from where Glenn and I had been chatting, if he'd thought about those words beforehand. “I never thought about it,” Carpenter told me. “What John needed that no American had before was speed." The previous Mercury flights - piloted by Alan Shepard and Gus Grissom - had been suborbital. They didn’t need the velocity Glenn needed to make it to orbit. What I didn’t know was that Glenn was on a different communications channel when Carpenter said those historic words. “I didn’t hear it at the time,” Glenn said. But 36 years later aboard Discovery, Carpenter was back in Mission Control and said it again, “Godspeed, John Glenn.” That time Glenn says he heard it in real time. Carpenter, a Navy man, has a love for outer space and inner space. When he left NASA, he explored underwater adventures as an aquanaut in the Navy’s Man in the Sea Project - at one point living and working on the ocean floor for 30 days straight. Later Carpenter served as director of the Navy’s Aquanaut Operations. It was now time for us to leave the reception room and head to the Visitor Complex Rocket Garden. There - alongside magnificent museum displays of the NASA rockets that conquered space –upward of a thousand people awaited their chance to honor these men. The two heroes rode to greet the awaiting crowd in a parade of Corvettes, the road chariots of choice for 1960s astronauts. It was a fitting nod to those fabled times at Cocoa Beach, Florida, when extraordinary men such as Carpenter and Glenn paved the way for human space exploration. I'll immediately clutch your rss as I can't find your email subscription hyperlink or e-newsletter service. Do you have any? Kindly let me understand so that I may just subscribe. Thanks. The US manned space program is now reduced to $65 million a pop taxi rides aboard the Russian Soyuz to the ISS. The lofty future of US manned space presence will be represented by private commerical space companies ferrying supplies and acting as garbage scows to the ISS, and selling $200,000 tickets to millionaires for a short jaunt into space. Maybe they can wave to the Russians and Chinese as they actively pursue vibrant deep space futures – starting with the moon. The U.S. manned space effort: in with a bang, out with a whimper. John Glenn, Big Al and Yuri Gagarin and the other early astronauts and cosmonauts are all heroes, even 50 years later. THE SOVIET UNION ROCKS!!! THE BEST AND THE GREATEST IN THE WORLD!!! Thats right..!! Thats all they are now... small little ROCKS.. scattered on the world map..!!! Sadly NASA's lack of vision and bloated bureaucracy are mostly to blame for the current state of the space program, along with two Shuttles' worth of dead astronauts. Their poor risk management practices, their silencing of engineers’ warnings and senior leadership only interested in covering up problems must all be corrected before the American people should trust NASA with more money. Alan Shepherd certainly was first. Sadly, he's no longer with us (nether is Gagarin), which makes John Glenn the earliest surviving spaceman. And still a fine ambassador for that era. Actually the dog was first....a Russian German Shepard to be specific. Wonder if it barked with a Russian accent !?! That was a chimpanzee. Didn't you see the movie? John Glenn was the first to orbit the Earth, where as Shepard was the first American into space. They were both involved in important stepping stones for our space program. I always wondered why Jager wasn't picked. Does someone know? Who is this Jager person? Perhaps you mean Chuck Yeager? 2. He never applied to be an astronaut. And tax payers who can't stomach the idea that technological advancement fuels the economy and nothing drives technological advancement like a vibrant space exploration program. less than one-half of one percent of our budget goes to fund the entire space program. It's been that way for over 40 years. Imagine what NASA could do with more money! look it up. Politics aside, Pres. Bush cancelled the shuttle to return us to the moon but didn't give NASA enough money to do it. Also, to Steve. It was Pete Conrad. and he said "It may have been a small step for Neil, but it's a heck of a big one for me". “It seems like it was two weeks ago,” former Sen. John Glenn told me. Wow... I guess that ought to serve as a reminder to the rest of us at how quickly life can pass you by. Fortunately, Mr. Glenn has the privilege of being able to reflect on his life and know that he has really lived. Many of us (probably most of us) merely exist. If I'm lucky enough to live to be 90, I hope I can look back on my own life and feel like I really lived it up. I might never make history the way he did, but I'd like to be able to think back on my own achievements and experiences and have some satisfaction. To not be able to do so would make growing old very, very depressing. Try this: A friend and I (both in our late 40s) did an exercise recently where we wrote down the 25 things in our life of which we are most proud. We then made a list of 10 things - some clearly on the unreasonable side but many attainable - that we'd like to do before we die. You've probably done more in your life than you think. You are so right. When I read and learn of men like these it makes me feel so small and unimportant. BUT I can and do look at my children, grandchildern and even my coute great grandchildren and I see what I have donehas been pretty important and I can smile and look back and feel I did something worth while. Those were the days when America was great. Glenn would've been a great President too. Times sure have changed. I grew up literally down the road from johnson space center, went to school with many children whose parents worked for nasa. a big thank you to everyone at nasa for everything you did for the community and the nation as a whole. Congrats on the milestone john glenn. Zero G and I feel...RRRROOOOLLLFFFFF!!! What Glenn did was a brave thing indeed considering the state of rocket technology at the time. And at our current state of rocket technology, I don't see the point of having a massive NASA budget to continually do the same thing - put astronauts into orbit around the Earth. I'd rather see the US put money into unmanned telescopes & probes (look at what Hubble has done!) and do R&D on radically new drivers that can take us, for example, to Mars in a person's lifetime. But we had that level of tech in the 1980's, but because of decisions made earlier by Nixon we got the shuttle program. Heck, we could get to Mars with a little under a year's travel-time if we actually funded NASA like other agencies of the united states' government(consider that our government spends more on air-conditioners each year for the military than NASA's entire annual-budget, or that the bank-bailout was more than the entire 50 year running-budget of NASA). That's not science-fiction. We could get there, spend a month, and make the return trip in president's term. Glenn's got great PR. No one hardly mentions Shepard or Grissom. first words when he stepped on the moon's surface? Pete Conrad – "Whoopie" It may have been a small step for Neil, but it was a long one for me." Not to take anything away from Alan Shepard or Gus Grissom, since they were just as brave and capable as John Glenn. However, John Glenn WAS the first American to achieve orbit. Shepard and Grissom did sub-orbital "hops." Glenn also had one heck of a scary ride compared to the other two, where his retro rocket package failed to jettison properly. Glenn and NASA had no way of know if the capsule was going to survive re-entry. Sad and Scary: Actually, I believe the retro package was left on intentionally. A faulty sensor indcated the heat shield was loose, and the retro package was left on to help hold it in place. It was an upper management decision, perhaps not a good one, and I believe it led to a change in how such decisions were to be made in the future. Glenn, long two weeks....speed it up buddy. The technology is going to remain costly as long as it's scarcely developed and operation is risk. But it has to be developed more before the costs can go down, it has to be put into operation before innovation and experience produces safer, more efficient design. You could convince investors that it's worth the cost in the long run, but where are they going to invest? Russia, China; countries that still HAVE a space program and are committed to investing in it themselves. Hm, now I wonder what Richard Garriott would say...when he wanted to go to space, he went via Russia. Do you think that he went via Russia for any other reason than Russia was the only space ferry available for hire? Certainly not NASA, who could have pocketed some change for becoming a tour company. Maybe we'd still be flying into space had the US done so. I was just visiting Nasa last month. Everyone is very sad about the end of the shuttle program. I can remember my elementary school sitting around a black and white TV with fuzzy reception watching this historic event. I was in 3rd Grade at the time and I still remember it. It was a really big deal back then. Yeah, Glenn actually mentioned this in the article. What's your point, arschloch? I am glad to meet scholar! Amazing knowledge of foreign languages. Yes. Yuri was the first man in space. There is a statue of him in Moscow I saw the last time I was there. That was quite an accomplishment, but John was the first to orbit the earth. You mean a stable orbit? Can you give comparative characteristics? Umm, actually Yuri did orbit the Earth when he went into space. And the fact that most of my fellow Americans don't even know his name is pretty sad. Yuri Alekseyevich Gagarin (Russian: Ю́рий Алексе́евич Гага́рин, Russian pronunciation: [ˈjurʲɪj ɐlʲɪˈksʲejɪvʲɪtɕ ɡɐˈɡarʲɪn]; 9 March 1934 – 27 March 1968) was a Soviet pilot and cosmonaut. He was the first human to journey into outer space, when his Vostok spacecraft completed an orbit of the Earth on 12 April 1961. From Wikipedia BrickHead! John Glenn was the first American to orbit the planet, not the first person. Gagarin was the first person to orbit the planet. Gagarin did one complete 108 minute orbit, Glenn did three orbits. Gagarin's capsule was under automatic control, although he had a key which he could use in an emergency to unlock the controls. Glenn had manual control. What often amazes me is the fact that the computers used on the Apollo missions had the computation power of a calculator. Wow. The bitter, garumphing comments here just show how small minded this country has become since 1962. Flumpha grump taxes. Gufla growl Obama. Grumble flump didn't deserve it. Whenever a real hero is honored the chorus of know-it-alls, nasty old cranks and bitter never-did-its come out of the woodwork. You guys don't measure up to John Glenn's shoelaces. How abut flump grumble grumble Glenn was an acting US senator who derelicted his sworn duty to go on a space junket that had no scientific worth WHATSOEVER despite the pretense and cost tens of millions of dollars? We are not supposed to have an "imperial" government where those in power do such things just because we have nostalgia for them. Glenn's dereliction of duty and abuse of his office for the space shuttle junket are inexcusable, and as a result, I no longer consider him worthy of admiration. he used up his "hero" credit with me on that stunt. and before I get the usual replies of "oh come on" and "what did YOU do with your life"? well, for one, I didn't abuse my political office and steal tens of millions from taxpayers while abusing science and taking some worthy person's place on the shuttle, so whatever I did or did not do in my life, I did not do that. People like you who waisted your education are embarrassing. How about googling and learning all the space science you use in your everyday life instead of being the hate coward in ignorant bliss. Try thinking how much science would trickle from being able to send humans to Mars and back. When you factor cost verse return you might be amazed, but then again people like you are too stubborn admit you might be mistaken. How did he derelict his duties? He became a senator after retiring from NASA. Did you think we shot a 70-something year-old senator into space??? I agree. Glenn's joyride also bumped a real scientist, who had trained years for that mission, off that flight. And who's your big hero, James? The monkey in a flight suit who went AWOL from the Texas Air National Guard? I remember thinking that for all that John Glenn was a true hero, he insisted on taking a seat on the shuttle for basically just a ride – bouncing an astronaut who would have contributed his/her share of the ISS workload. However, consider: John Glenn's junket ride paved the way as the first tourist into space – with a million dollar ticket. We can all look forward to $200,000 tickets to millionaires for their rides into space aboard a commercial craft built by private companies – which is what the US manned space program will be reduced to – that and commercial delivery crafts/garbage scows to and from the ISS. Right now, the US manned space presence proudly manifests itself through taking $65 million Russian Soyuz taxis to the ISS. The US manned space presence: In with a bang, out with a whimper.. Isn't it a little self serving to post this about an article that has nothing to do with it? A little, um, selfish? Dare I say, satanic? This guy applauds the Barak Hussein Obama, the same guy who virtually abolished the U.S. Space program, and I'm supposed to accept this old clown as an Ameirican hero. NOT!!! The more forum posts I read, the more I am beginning to think that far-right conservatism is a mental disorder. Misanthropes like you make me embarrassed for where this country has gone. Not being able to see that what John Glenn did was truly an amazing achievement is to display your small-minded, petty and uneducated ignorance. Congratulations. You win the Bitter Jerk Award of the day. erm. i would like to see their photos. why no photos? before and after shots would be nice. Those were the days where real men were real heroes. ...and women ratted their hair into big bee hives and glued it with hair spray. And somehow 50 years later I still get wood at silk stockings. Sewing footballs for Premier League Clubs,though the've been doing that for years and oleppe moaned calling it slave labour,it may pay peanuts but some would say, little is better than nothing when nothing is all you have..
NASA served its purpose well, but now its time to shut it down. Leave space to the military (who runs most of it anyway). The financial cost of NASA now is far to great with little if any return. What do you mean, little return? There are communications satelites that help millions worldwide every day. You have GPS satelites to guide you when you're lost. Hubble and the Mars rovers have given us amazing insights into the universe and solar system. How much return has spying on Iran or the movements of the late Saddam Hussein given you? Mark, I agree with you 100%. But, you need to know that GPS is a US Air Force program, not a NASA program. So the less than one half of one percent of the fed budget is too much for spacecraft orbiting Earth, Mercury, Mars, Saturn, on the way to Mars, Jupiter, Pluto? What will that $17.7 Billion buy that is better than knowledge about our solar system and Universe? George, you're making a common mistake in trying to use actual facts to win your argument. People who cannot and will not see the value and wonder of the space program are never going to allow little details like the truth get in the way of their precious opinion. "little if any return'" types the guy on his computer who uses a mobile phone while eating his preserved food for lunch. Just a tiny example of the technologies directly related to Apollo. If you were to list all the science we use in our everyday lives that directly and indirectly impact our everyday lives with ties to space science, you might be amazed. Then again, maybe not, you have already showed you prefer ignorance. Plus, the ridiculous amount of medical breakthroughs and technologies that are a direct result of the research put into keeping people alive in space. Like most people, you only associate NASA with space exploration. Much of NASA's work involves the first 'A'-aeronautics. NASA does a tremendous amount of work on things like wing design, aircraft efficiency, aircraft noise and environmental pollution reduction, and more. For me, a much better time in our history. John Glenn as well as all of the other astronauts are brave men and women who put their lives on the line just like other explorers have for all of our benefit. Why do people always have to complain? It was a different time. Thank you John Glenn and all of the others who came after to help us see into the final frontier. I was just 1 when they landed on the moon. It was such a event for mankind. I wish I could of been able to watch the drama play out on t.v. Another event that isnt talked about thats schedual to happen in December is the Voyager1 probe will leave our solar system and enter interstellar space.Another historical moment. It still sends data and it will be interesting to know what data it will send back. Fortunately for us, that crack team of astronomers from the famous Sarah Palin Galactic Obsevatory / Bait Shop have teamed up with engineers and physicists from the equally prestigous Sarah Palin University to pick up where NASA left off. This elite group of specialists has been code named "The Space Baggers". Supposed to be funny, not. He was a Democrat, y'know. That means half of us have to hate him for no reason. Politics aside, I have always respected John Glenn. I never knew of them leaving any tax dollars in space, lots of junk, yes, cash....that's all spent down here. John Glenn....true American war hero, brave patriot, real man.....and a Democrat! Anyone who achieves something is democrat .. Google founders, yahoo founders, Steve Jobs, etc. Republicans on the other hand make their money from selling oil, playing the market, or financial transactions ..anything other than invention .. I mean look at Donald Trump or Mitt Romney. I think Abe Lincoln would disagree with you. A tip of the hat to you, John Glenn. I've got tremendous respect for the intelligence and bravery of you and the original Apollo astronauts. John who?? What? Who the hell is this guy?? I though Niels Armstrong was the first man in space? You're right, they're wrong. No need to read anything, none at all. Armstrong was the first man on the moon, not in space. We didn't exactly go from riding bicycles to walking on the moon. Further more. Glenn wasn't the first man in space, or even the first american. He was the first american to _orbit_ the earth. Shepard was the first american in space. Achieving orbit is really really hard compared to getting to space. You can basically get to space with a fancy balloon going straight up. Getting to orbit involves a whole lot of speed horizontally... hence the famous quote "Godspeed, John Glenn"
I'd rather sit on a rocket built by the lowest bidder than a balloon to get into space! 😉 Funny to see this article as I'm in the middle of reading Gene Kranz's "Failure Is Not an Option." Once again, I feel as if the Internet has gone beyond reading my browsing and into reading my mind. Go back to junior high school. You apparently slept through your 20th century history class. I was at school in Europe when the man space programs began.It was huge deal and inspired many children towards an interest in science. I wrote to the Russian and USA embassies for information and can still recall the differing responses, loads of stuff from the Russians for free and a request for payment from the Americans. As I was 10 I went with Russians. USA missed out on the PR value outside of the USA at the start but they got better later (got to see real moon rocks at the Royal Society in London plus armed marines). I wrote NASA as a kid and got a bunch of free stuff. Maybe they had a different policy for international requests. "got to see real moon rocks at the Royal Society in London plus armed marines)." I doubt they came courtesy of Russia. They should have sent thank-you notes to every taxpayer who footed the bill for their jaunt into space. We should thank them you nimrod. Not only did they risk their lives multiple times but we also made considerable profit and technological advancements off of the Mercury and Apollo space programs. C'mon Tony. You have no idea what made this country great. Do you really think that the Mercury and Apollo programs were for the astronaut's glory and amusement? In fact, these men were among the bravest soldiers we have seen. Traveling into space strapped to a 100 ton rocket that might explode would make anyone a bit nervous especially in the 60's. Obviously, you're not in the industry, so you don't know. There's a group of people known as the US astronaut corp who did not exactly do cartwheels when Glenn took a seat on the Space Shuttle. They paid their dues – just as Glenn did – in earning a flight. Then a little something called politics reared its hoary head. BTW: I know a few folks at the Lewis Research Ctr who were none too happy when they were forced to accept a name change to Glenn Rsearch Center. Sorry Buck, I replied to the wrong post. Kennedy kept him from flying again becuase he didn't want anything to happen to our hero. So, I don't care if John Glenn looked out the window of the shuttle during the whole flight. There always seems to be some tool posting from his mom's basement who would complain that they didn't use a new rope at a hanging. Put your head back in the sand Tony. Neil Armstrong wrote a wonderful letter of thank you to the people who built his lunar space suit, for doing it so well that he survived the harsh conditions in space. When was the last time you wrote a thank you letter of ANY kind to ANY person? We should be thanking all of the people involved in the space program, no matter what their role, for pulling off the impossible and for bringing science fiction to life.